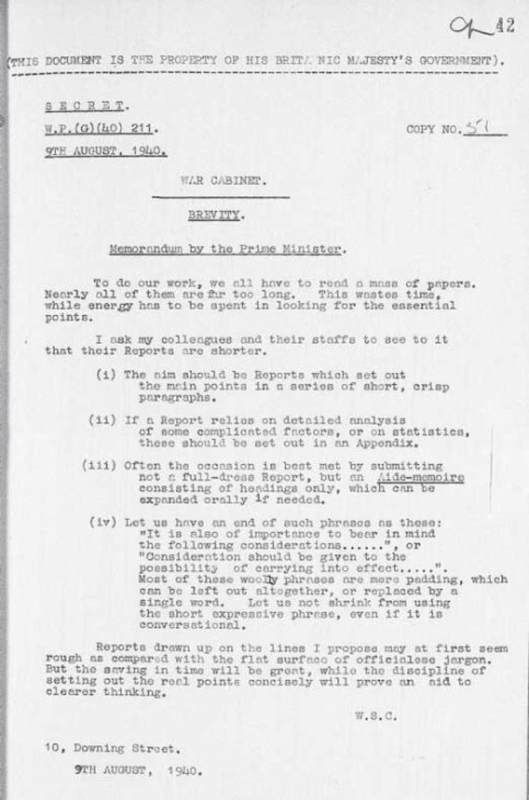 Bloated, complex and lengthy reports: “To do our work, we all have to read a mass of papers. Nearly all of them are too long. This wastes time, while energy has to be spent in looking for the essential points”. Many of us will relate to management reports like these. Research by BCG showed that in the 20% most complex organisations, managers can spend 40% of their working week reading and writing reports. Much of this is because reports are more voluminous and bloated than their purpose should serve. Simplicity, through subtraction. Less overall reports. No reporting for the sake of reporting. And for those reports which are needed, making them shorter and more insightful – minimising time for the reader. Ban unnecessarily woolly language: “Consideration should be given to the possibility of carrying into effect…. Indeed, all change feels uneasy at first. The report producer needs to have confidence in less leading to more – ignoring the natural assumption that more information must mean more insights. Busy people appreciate the power of less, whether that be a war time Prime Minister or a growth-seeking CEO. Saved time (for both report writers and report readers). Clearer thinking, with crisper insights, leading to better decisions. Takeaway: Leaders can and should set the simplicity tone. Sometimes it takes a crisis to force people to be simple and concise. If you don’t have a burning platform, go light a fire.